At Inspire Fitness for Wellbeing, we understand that long-term health, vitality, and longevity requires an integrated approach to exercise, nutrition, and lifestyle behaviours. The cornerstone of our approach to supporting your health and wellbeing is our unique training philosophy, founded on the principles of corrective exercise. 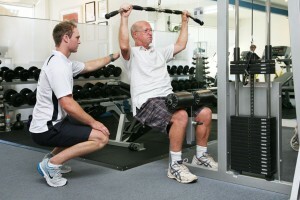 We aim to reduce the potential for injuries during structured exercise and in the activities of your daily life. We strive to enhance your performance in exercise and sport by improving your movement quality and efficiency, so you can grow in your capacity to move well and move often. Think about how a wheel alignment reduces wear and enhances the performance of your car. Engaging in corrective exercise helps to address your musculoskeletal imbalances (i.e., misalignments with the structure and function of your muscles, tendons, ligaments, joints, and bones), which will reduce the unnecessary wear and tear that accumulates from inefficient movement, and will ultimately enhance your quality of movement and in turn, your quality of life. Corrective exercise is a relatively new term and is largely misunderstood within the fitness industry. As specialists and leaders in the field of corrective exercise, we integrate these advanced exercise techniques into all our training programs to ensure our clients undertake their exercise safely, and to ensure that our clients reach their health and fitness goals without interruption due to injury. Before you embark on a fitness regime or undertake an exercise program, it is vital that you understand what corrective exercise is and how corrective exercise is beneficial to your fitness goals. Starting a regular exercise routine is the most valuable habit you can develop for your long-term health and fitness, but did you know that the pre-existing postural and biomechanical conditions within your body can determine which exercises are “healthy” and which exercises are “harmful” to your body? Underlying our corrective exercise approach at Inspire Fitness is our understanding that each person’s body is unique when it comes to posture, stability, and mobility. When one or more of these attributes are limited or sub-optimal, they will reduce your ability to move freely. The impact of these movement limitations can be subtle, barely noticeable in the short-term. But left unattended, these small deviations away from high quality movement develop into large and very noticeable impacts on your body in the long-term – think low back pain, the dull ache in your hips, the twinge of shoulder pain that never quite goes away. Whether subtle or substantial, these impairments diminish the quality of your movement patterns, forcing your body to make compensations in order to function normally but not efficiently! Corrective exercise practitioners understand that the body’s systems do not work in isolation; they work in integration. Through corrective exercise, we prescribe individually-tailored movements to re-educate your neuromuscular system, integrating your mind with your body to improve how well you move. With corrective exercise, we begin to re-educate your neuromuscular system with the correct patterns for movement. Your neuromuscular system is made up of the nervous system (your brain, spinal cord, and nerves) and your muscular system. Re-educating these two systems to “communicate efficiently” with each other is an ongoing process, but one that reaps sustained rewards. Corrective exercise teaches your nervous system to coordinate the firing of certain muscles in the right sequences, to engage your muscular system in the correct activation patterns and integrate muscle contraction and relaxation to produce coordinated movement. Assessing and testing for biomechanical and postural changes in your body prior to the commencement of an exercise program is a vital first step. At Inspire Fitness, we scientifically assess your body and movement prior to the commencement of an exercise routine. Regardless of your fitness goals – whether you want to lose weight, improve your fitness, or increase your strength – our screening process ensures that we set you up correctly on an exercise program that addresses your goals while also improving the mechanics of your body to avoid injury and enhance the quality of your training. Why do we conduct initial client assessments and regular reviews? Too frequently people embark on an exercise program – at their local gym, in a boxing class, in a group fitness session, or even down at their local park – with great intention and motivation to achieve better health and improved overall fitness. Sometimes they are assessed prior to commencing a new program, but often not; and often these individuals will commence exercise with tremendous vigour while following their trainer’s instructions perfectly. A few weeks go by with a perfect record of exercise compliance, and perhaps they have even lost weight and are starting to feel good…but then they begin to develop some aches and pains, typically in the lower back, knees, shoulders, feet, or neck. This happens because their exercise program has not been designed with respect to the current state of their body while progressing in an appropriate, incremental fashion towards their goals. However, the overarching objectives of the Inspire Fitness corrective exercise approach is to help you address pre-existing imbalances and work steadily towards sustained positive health and fitness outcomes. Aren’t all forms of exercise good for my health? Whilst the intention of the personal trainer may be good and honourable, even if you perform an exercise 100% correctly and with perfect technique yet the exercise is harmful to your body, the consequence can result in injury. It may occur as an acute injury, or more commonly it will present over time with the progressive onset of ache or pain as you slowly overload a muscle or joint, eventually irritating the body region to the point of pain. Poor posture, instability, and diminished mobility cause deviations from your natural efficient biomechanical movements, which result in excessive overload of your muscles and joints. These structures may include your knees, your lower back, your shoulders, your neck, and so on. Any structure that has experienced repeated and prolonged inappropriate loading becomes irritated and eventually painful. Overcoming this path to injury is NOT a matter of just stopping a particular exercise or avoiding a particular movement pattern. And stopping exercise altogether due to a fear of exacerbating a problem is also not a suitable solution. Avoiding one or two particular exercises is just a band aid solution – it doesn’t get to the cause of your pain, injury or dysfunction and help you overcome the problem for when you move in your daily life. Stopping exercise altogether doesn’t solve the problem either and will lead to deterioration in your health. Corrective exercise is about avoiding this scenario as you embark on an exercise program by progressively challenging your body through individually-tailored training. The best method to avoid these scenarios is to integrate corrective exercise into your training program and combine it with traditional fitness training. Training safely isn’t just a matter of perfectly following the lead from a personal trainer. What if the exercises you are being taught are inappropriate your body? But I am not injured. Do I really need Corrective Exercise? Pain or injury isn’t the only sign of poor biomechanics or dysfunction within your body. Pain is certainly a symptom of poor mechanics within your body – but having no pain or injury does not guarantee that your body is moving freely and correctly. Many people report no pre-existing injuries or muscular pain in our screening process yet show significant negative changes in their posture, mobility and/ or flexibility. Sometimes these changes are subtle, and in others we assess significant deviations away from the correct biomechanics of the body. The absence of injury or pain is not a sign that your body is moving freely or is in perfect alignment. Have you ever felt stiffness in your muscles or joints? Have you experienced how that stiffness limits your capacity to move correctly? Despite the restrictions imposed by muscular or joint tightness, your body will compensate to find another way to produce movement (albeit gingerly and inefficiently). These compensations often overload structures within your body (commonly the low back, neck, feet, and shoulders). For example, if you are stiff in your upper spine (thoracic spine) due to prolonged periods of sitting at a desk, you will still be able to rotate your spine but the stiffness will cause your body to compensate by exaggerating rotation through the lower back instead (lumbar spine). With repetition of this spinal rotation, you continually overload the joints of your low back, which can easily progress to persistent low back irritation. Symptoms such as these are common targets of corrective exercise, which can be used to unlock the tightness in your upper spine and re-train your nervous system to coordinate appropriate rotation through all joints in your spine. In such a case, corrective exercise can help you to move efficiently and freely by using all joints of your spine for rotation, just as your body has been designed to do. With the goal of corrective exercise being to address the underlying biomechanical, postural or movement faults within your body – undertaking corrective exercise techniques is vital regardless of whether your NOT injured or are not currently experiencing pain. Our corrective exercise approach at Inspire Fitness is designed to ensure you train safely towards your health and fitness goals without getting hurt or causing an injury. We use corrective exercise to also maximise your results from exercise by increasing the quality of your movement. We use corrective exercise in our personal training and exercise physiology programs independent of your current injury status. Corrective exercise should be a vital ingredient in any structured exercise routine. Without it, you are “running the gauntlet” and risking the health of your body.